Main coarse, servers 4, 20 mins. 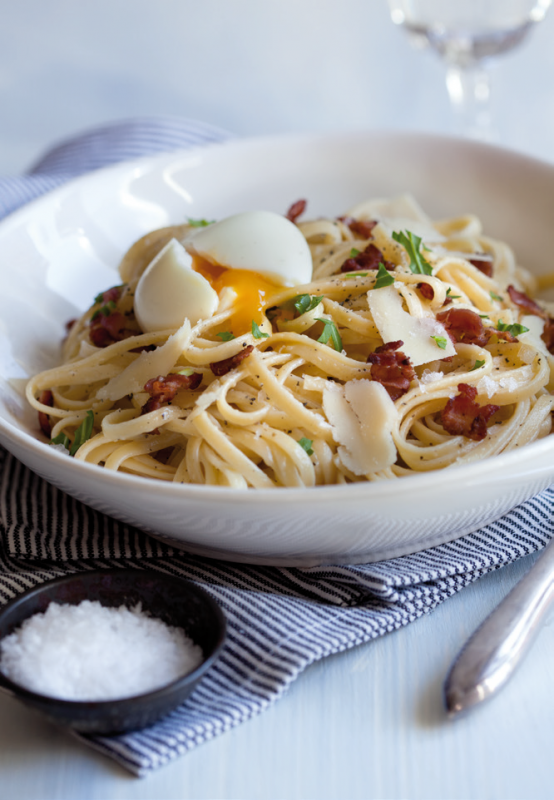 A creamy Pasta Carbonara is familiar with most people, here we make an exciting variation of the up-to-date pasta dish. By just boiling the eggs for a short while, they will have a beautiful running yellow which you then stir down in the pasta. 1. Shred the bacon and fry it gently. Allow to drain on household paper. 2. Boil the pasta in salted water. Stir together the cream, black pepper, grated cheese and salt flakes. 3. Put the eggs in boiling water and boil for 3.5 minutes. Mix the pasta with the cream and cheese mix. 4. Put the pasta in serving bowls and sprinkle over the bacon and chopped arugula. 5. Peel the eggs and put an egg on each serving. 6. Finish with seasoning with salt flakes, grated black pepper and grated parmesan. Available in: 250g Carton box.